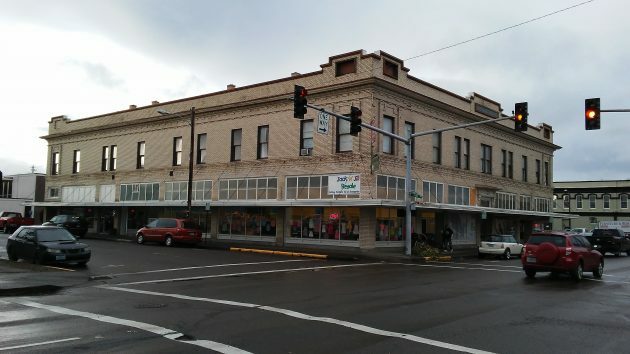 The “Knights of Pythias Building” at Lyon Street and Third Avenue. One of downtown Albany’s century-old buildings will get a facelift this summer with a little bit of help from CARA, the central area urban renewal district. 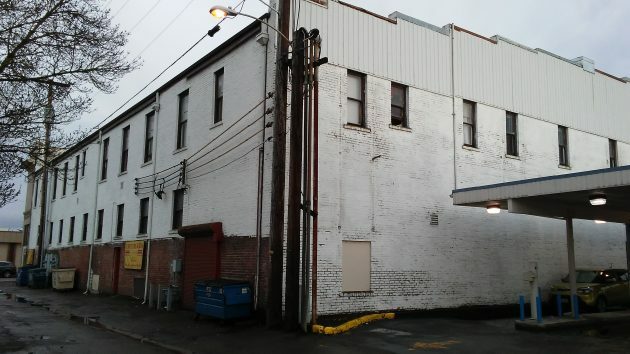 Daren Clowser, owner of the “Knights of Pythias Building” at 230 Lyon St., asked for a $10,000 grant toward a paint-and-fixup project on the exterior that’s expected to cost about $25,000. The board voted to grant his request under CARA’s storefront revitalization program. Clowser owns and manages Furniture & Beds of Oregon, one of four businesses in the building he bought four years ago. The building dates from 1913 and is still sound, he told me — massive, sturdy beams, no leaks in the roof or water in the basement (even during Thursday’s deluge), and so forth. But the exterior needs attention. The back and side walls will get a new coat of paint. The plan is to paint the west and north sides that face away from Lyon and Third. Now those walls are white, and Clowser hasn’t yet decided on a different color if any. As for the two façades, facing Lyon and Third, the natural-colored brick walls will be washed but not painted. The staff report to the CARA board said that as part of the facelift, open seams will be caulked, and bare wood will be stained and primed. In addition. the historic windows will be kept in place and repainted, caulked and repaired as needed. Besides the businesses on the ground floor — the furniture store, a second-hand clothes shop, a music store and a barber shop — the building contains 14 one-bedroom and studio apartments on its second floor. Clowser told me the apartments are consistently filled. Living downtown, it seems, is getting popular again, especially among young people. Curt Sorte, of Sorte Painting, appeared with Clowser at Wednesday’s CARA advisory board meeting. His bid for the work — $7,030 for window repairs and $17,600 for the exterior repainting — was the lowest of three. Soooo happy to see this happening!! I am so happy to hear this! I live in this building, I have lived here for 6 years and I love it! It’s beautiful inside but many repairs are needed inside. I am excited to hear they are planning on fixing up the outside and the windows! Daren is a good man and this project is a “win-win” for downtown. I’ve bought furniture here, have gone in from time to time to check out the basement items, and walk out knowing I visited the right place. Daren also gives of his free time to help broadcast high school sports on South Albany’s WillametteValleySports.com. Keep up the good work and the great spirit Daren!